For too long, prepaid phone users have been treated like second-class citizens when it came to smartphones. Aside from the occasional gem, most prepaid smartphones were hardly worth your time or money--and even the most expensive prepaid phones had only middling specs. All of that is about to change. The LG Connect 4G ($320 on MetroPCS as of 3/7/2012) is the first prepaid phone that we've seen to have specs equal to or better than those of similarly priced smartphones on contract carriers. With an impressive processor and price, the Connect is an enticing option if you're thinking of making the jump to a contract-free carrier. The LG Connect is one impressive-looking phone. With its piano-black finish, the Connect doesn't look out of place next to other high-end models like the Samsung Galaxy Nexus. The overall design is simple: The volume rocker and the microUSB port are on the left spine, while the power button and the 3.5mm headphone jack sit comfortably on the top. Like most modern smartphones, the Connect has two cameras, but we'll get to those a bit later. In size, the Connect isn't much larger than the original HTC Droid Incredible or the iPhone 4S. The phone has a 4-inch display, but it's nice and compact, and it should fit comfortably in most bags or pant pockets. At only 4.83 ounces, it should be light enough to hold comfortably for long periods of time. While the Connect felt well designed on the whole, the plastic battery cover really detracted from the experience. The material feels drastically different from what LG used on the phone's front face, and it does cheapen the Connect's feel. It might not be a big deal for most people, but I was not a fan. With a beefy 1.2GHz dual-core Snapdragon processor and 1GB of RAM, the Connect easily handled all of the games I threw at it. Even more-demanding games like Dead Space were no match for the Connect's graphical prowess. The touchscreen, on the other hand, was flaky at times. More often than not, I would have to swipe or tap the screen repeatedly before it would register the input. This occasionally happened when I tapped out a text message and or typed a webpage address into the browser. The problem seemed to be limited to preinstalled apps--the aforementioned Dead Space registered my swipes and taps without issue. So this may just be a software issue that can be fixed with an update in the future. The Connect's call quality was considerably better than that of another MetroPCS phone I recently reviewed, the Samsung Galaxy Attain. Here in San Francisco, voices came through clear, if a little on the quiet side. Call quality will vary depending on your location, so check coverage maps to make sure you have good service in your area. 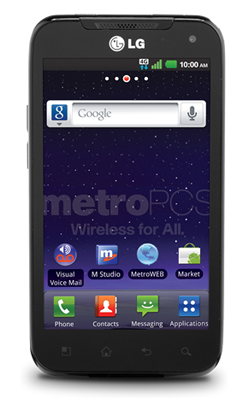 That 4G at the end of its name isn't just for show, as the Connect can connect to MetroPCS' LTE network. In my tests, though, the Connect achieved average download speeds of only 2 megabits per second (mbps) and upload speeds of about 2.5 mbps. These speeds are slow when compared to other LTE networks from AT&T or Verizon (which can achieve speeds of around 25 mbps), and fall more in line with what you get using Sprint's WiMax 4G network. My results were in an area with good LTE coverage so you'll probably see slower speeds in areas with poor reception. One downside to having LTE is that it eats away at your battery life. With its 1540 mAh battery, I made it through about half a day of moderate usage before I needed to plug the phone into a power source. This usage included browsing the Web over LTE, downloading apps, and playing games on my hour-long commute. Your mileage will vary depending on how much you use your phone and which apps you have installed, but if you're a power user, you will definitely want to have a charger with you on longer excursions. One of my biggest problems with the Attain was the number of extra apps that came preloaded on the phone. Before I could even sign into my Google account, I saw several screens in the app drawer already populated with apps I knew I would never touch. Unfortunately, the same can be said about the LG Connect. Some of the preinstalled apps merely take you to the Android Market where you can download the app to your device (that's right; apps that ask you to install apps), while others are simply bookmarks that open a page in the browser. You can't remove either of these types of apps, so they'll always take up space in the app drawer. Of course, not all of the preinstalled apps are like this; some, like Rhapsody Music, can actually be useful. The MyExtras app (of which I am not a fan) is back, along with a shortcut to a MetroPCS-branded app store. The selection in the MetroPCS app store is pretty limited, though I did see both Fruit Ninja and Tweetcaster available. Downloading an app from the MetroPCS app store requires you to manually install the app yourself once it has been downloaded. As such, the phone ships with the ability to install apps from other sources by default. This can be a bit of a security risk--most Android phones come with this option off--so you may want to uncheck it in the settings once you have set up the phone. The Connect ships with Android 2.3 (aka Gingerbread), with, currently, no word on an update to Android 4.0 (Ice Cream Sandwich) any time soon. The Connect does have a custom interface overlay, similar to what we have seen on other LG phones. While it dramatically changes the way Android looks, I actually enjoyed the extra features that this overlay added to the Connect. You have quick access to the settings via the notification bar, and all of your notifications appear in a notification center titled "What's New." Both are useful features you won't find in the standard version of Android. Thanks to its dual-core processor, the Connect should be able to run most of the apps in the Google Play Store (née Android Market). I tried out only a small handful of games, but in my time with the phone, I never ran across an app I couldn't run. Movies streamed fine over a 4G LTE connection, but I did notice that the screen would occasionally flicker while playing movies or other media--it's subtle, but it's definitely something to be aware of. The Connect makes use of Dolby technology in playing back music, but I didn't notice much difference between audio playback on the Connect and my Galaxy Nexus. The Connect ships with 2GB of internal storage and a 2GB microSD card, but you can upgrade to a larger one should you need the extra space. Photos taken with the Connect's 5-megapixel camera were dark and not especially sharp. Indoor shots, especially, didn't look that much better than a photo you would get from an old flip phone; in one indoor shot, we noticed what appeared to be dithering in a solid-color backdrop. The Connect is capable of recording video at 720p resolution--though videos were blurry and the lens would take too long to focus on a subject. The Connect has a front-facing VGA camera that you can use for video calls, but the quality is subpar compared with front-facing cameras on other phones. In short, the Connect won't replace your stand-alone point-and-shoot camera anytime soon. Even with its weak camera, the Connect is still the phone to get if you're looking for a contract-free smartphone. With specs better than those of most contract-bound devices, the Connect really raises the bar for what to expect from prepaid phones in the future. I hope LG remembers to update the Connect to Ice Cream Sandwich later on, but as it stands, the Connect is an excellent phone for an excellent price. The LG Connect 4G is one of the best pre-paid phones available right now. Period.